Born at Thorn, West Prussia on 12 April 1855, he emigrated to the United States with his family in 1874 and settled at Kansas. He received an MA degree and started teaching in 1882 and was ordained to the ministry two years later. He taught school in Kansas for 11 years and co-founded Bethel College at Newton, Kansas. In 1891, at the invitation of George Bryce on behalf of the Manitoba Department of Education, he came to Manitoba to serve as inspector for Mennonite schools of southern Manitoba (1891-1903), and as Principal of the Gretna Normal School (later renamed the Mennonite Collegiate Institute) until his death. 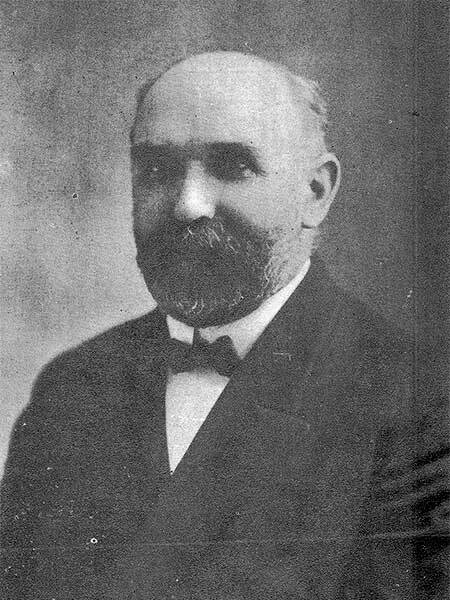 He served as Editor of Der Mitarbeiter, a newspaper for the Conference of Mennonites in Canada and, in 1922, he chaired the organizational meeting of the Canadian Mennonite Board of Colonization. He died at his home in Gretna on 29 December 1934 and was buried in the Gretna Cemetery. He is commemorated by a monument on the Winnipeg campus of the Canadian Mennonite University. “Prof. H. H. Ewert, noted Mennonite educationist and minister, is dead,” Winnipeg Free Press, 31 December 1934, page 1. “Prof. H. H. Ewert, veteran teacher, buried at Gretna,” Winnipeg Free Press, 31 December 1934, page 1.